Nokia has launched only one high-end device in 2017, i.e., the Nokia 8. Nokia 8 features a Snapdragon 835 processor, Dual Rear Cameras, glass & metal design but no bezel-less display. Now, as expected, Nokia 9 is launching soon, which is going to be a high-end phone, just like the Nokia 8. So far, there were only benchmark leaks that revealed some specifications. 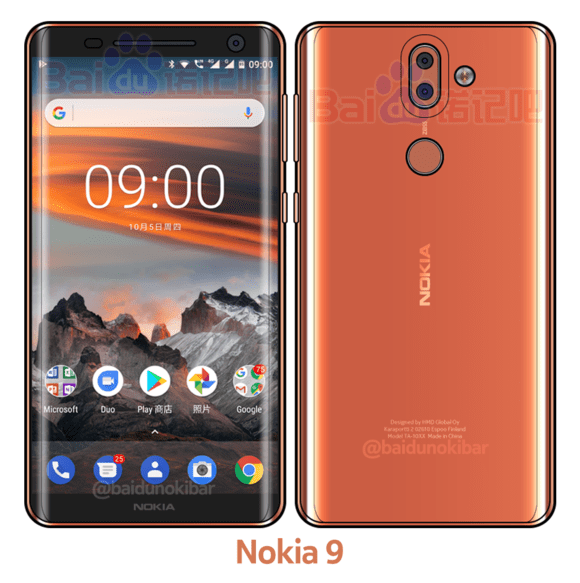 Today, we finally got the first look at the final design of Nokia 9 via a reliable source. So, the image above shows the front and back of Nokia 9and you can notice that on the back, the phone has a curved Glass or 3D Glass, as on the newly launched Moto X4. Also, there is no front-facing fingerprint scanner as it is now on the rear, below the camera module. Speaking of the camera, there is a dual camera setup on the back with Zeiss optics and dual LED flash. The volume rockers are on the right with the power button. The display is AMOLED and has negligible bezels on the sides. It is good to know that Nokia is finally following the same trend as all the major smartphones of this year. As per the source, this is a 5.7-inch Quad-HD Display with a resolution of 2560x1440p. So, it is a normal display with the 16:9 aspect ratio but with very less side bezels. THe rumored specifications include Snapdragon 835, Android Oreo, 4/6GBR RAM etc. There are still some doubts regarding the specs as a recent report from NokiaPowerUser suggests that the phone didn’t leak via GFXBench. Let’s wait for some more details about the phone. Stay Tuned.